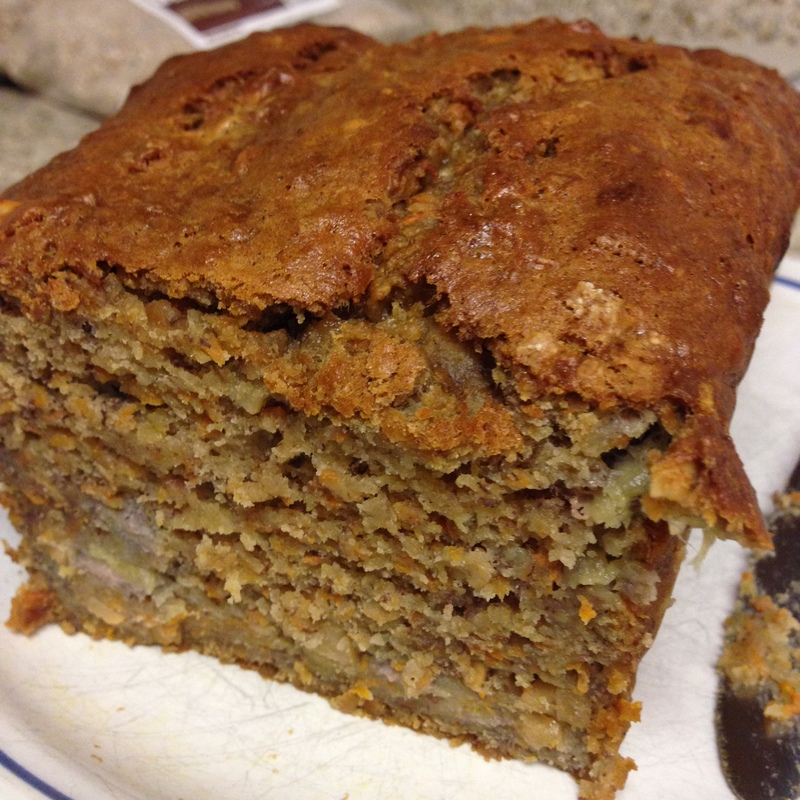 Banana bread is one of my favorite treats. This one is a little different with the addition of carrots. We made it when D’s parents were in town, and then we used it as the base for some amazing french toast! Preheat your oven to 350 degrees. Lightly grease a loaf pan with non-stick cooking spray. In a large bowl, combine the bananas with the butter, brown sugar and eggs until well combined. Stir in the flour, baking soda, and salt until just mixed into the wet mixture. Mix in the spices, carrots and cashews until blended. Bake for 60 to 75 minutes or until a tester near the center comes out clean and the loaf is set. Remove the loaf from the pan and cool completely on a wire rack. 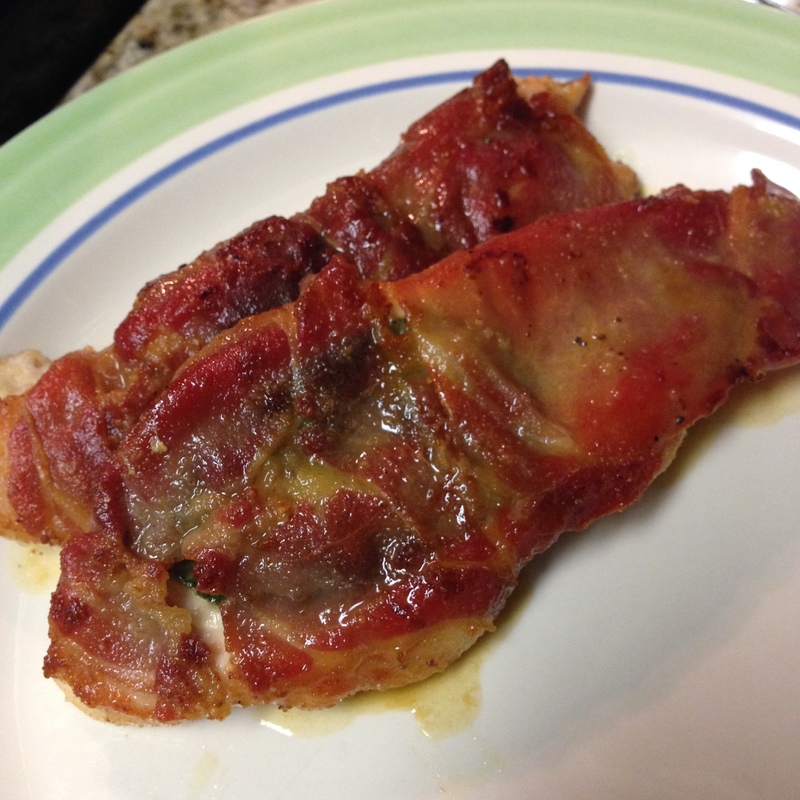 “Saltimbocca” — or “jumps in the mouth” — is a classic Italian preparation for veal. You add sage and wrap the cutlet in prosciutto, before cooking it with white wine and butter. D and I adapted it for some turkey cutlets we picked up and served it with a green bean and potato salad. On a large plate or in a baking dish, combine the flour with the cheese, garlic powder, paprika, salt and pepper. Top 1 of the cutlets with a sage leaf. Top the cutlet with a piece of the prosciutto, wrapped around to the back. Lightly dredge the cutlet in the flour mixture and set aside. Heat half of the olive oil in a large nonstick skillet over medium heat. Add 4 of the cutlets, sage side down, and cook until golden brown. This should take roughly 3 minutes. Flip the cutlets over and cook until golden brown and cooked through, another 3 minutes. Transfer the cutlets to a plate. Heat the remaining oil and cook the remaining 4 cutlets. Deglaze the pan with the white wine, scraping up any brown bits from the bottom of the pan. Allow almost all of the wine to cook off. Whisk in the broth and allow to simmer until 2/3 reduced. Stir in the lemon juice and butter. Whisk until the butter is melted and incorporated into the pan gravy. Remove from heat. Season with salt and pepper. Note that the sauce will be very lemony. This is what you want to offset the prosciutto and sage. Serve the cutlets topped with the pan gravy. 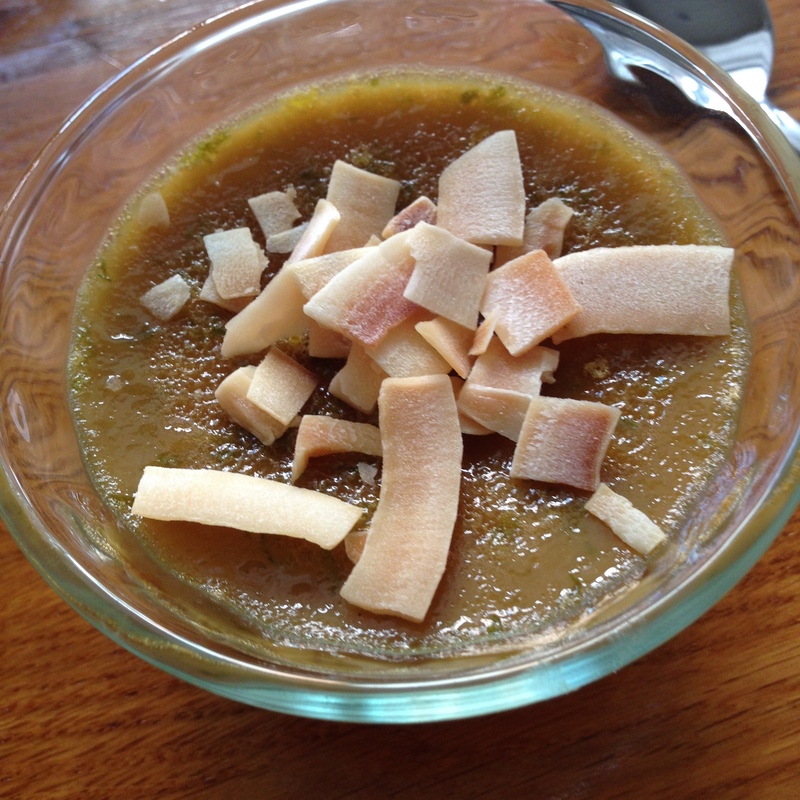 This custard has a very distinctive flavor due to the coconut milk. I really like its 5-ingredient list that mixes the coconut with lime. It’s a light(ish) way to end a good meal and can be made ahead of time. This means you get to enjoy the meal from start to end! In a medium mixing bowl, whisk together the eggs and sugar until smooth. Whisk in the coconut milk, vanilla, lime zest and juice. Pour the mixture into 4 heatproof glasses, like ramekins or another ovenproof dish. Set the ramekins in an ovenproof baking dish with high side. Pour hot water into the larger baking dish, until the water reaches halfway up the sides of the ramekins. Bake for about 45 minutes to an hour, or until the custards are set in the middle. Remove the pan from the oven and (carefully) lift the ramekins out of the water bath. Allow to cool at least 10 minutes before serving. If you’d like a contrasting texture, top with coconut chips! We served this when D’s parents were in town. 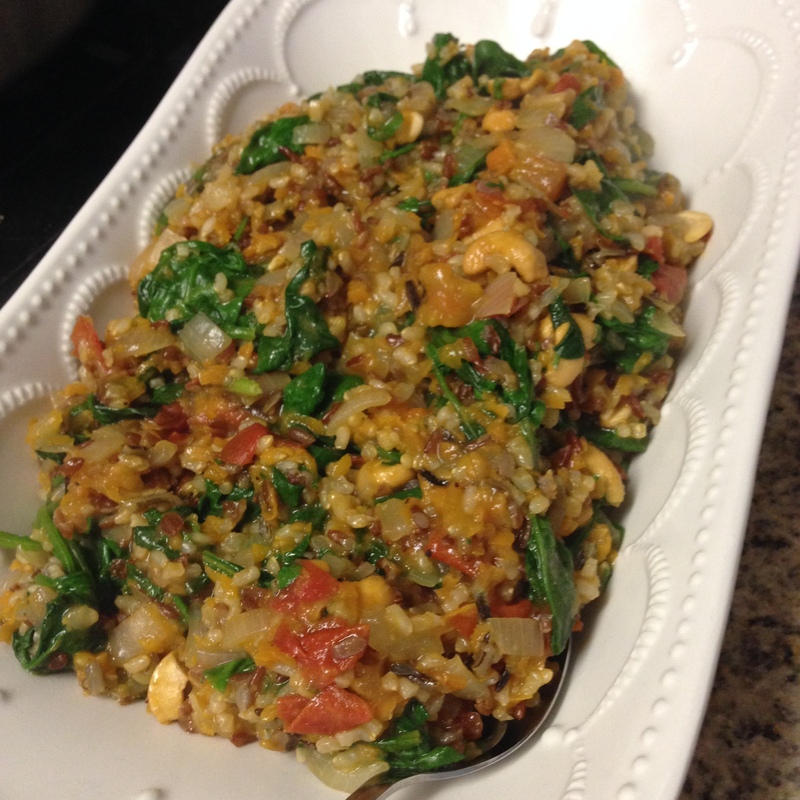 It was pretty easy to put together and a really fun veggie side dish with tasty rice. It’s not particularly spicy, which makes it an easy complement to other flavors. Place the rice in a small bowl and cover with cold water. Allow to soak for 20 minutes and then drain. In a large, deep skillet, heat the vegetable oil and the butter over medium heat. Add the onion and garlic and cook for about 5 minutes, or until starting to soften. Add the tomatoes and continue cooking, another 5 minutes. Mix in the rice, stirring to coat. Continue cooking another 2 minutes. Mix in the cumin and garam masala spices. Stir in the carrots. Season lightly with salt and pepper. Mix in the stock and stir well. Bring to a boil and then cover. Simmer over low heat for 20-25 minutes, stirring occasionally, until the rice is tender and the liquid cooked away. Place the fresh spinach on top of the rice mixture. Cover again and cook another 2 minutes to start wilting the spinach. Remove from heat and mix the spinach into the rice. You are currently browsing the Muffin Bites blog archives for June, 2014.